First Class M.Com. Or B.Com First Class. Or Pass in IPCC (formally known Intermediate) of the Institute of Chartered Accountants of India. Or Pass in Intermediate examination of the Institute of Cost Accountants of India. The Applicant should pay the prescribed Fee as per the Notification in detailed above and obtain fee paid receipt with Journal Number in the first instance. 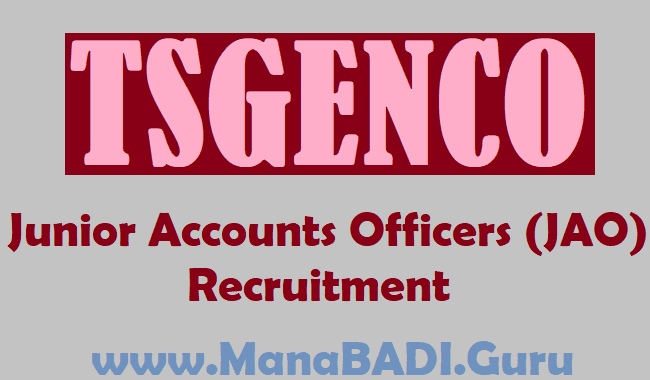 After payment of Fee, the Candidate has to logon to the website http:// www.tsgenco.co.inandclick on APPLY ONLINE link or directly visit http://tsgenco.cgg.gov.in to view the detailed Notification, User Guide and Application Form. The applicants have to provide payment details (journal number and date) and upload the scanned copy of passport size photograph with signature (see instructions for scanning and uploading photograph with signature) and then invariably fill all the relevant columns/fields in the Application. Immediately on submission of application, applicant will get an acknowledgement in the form of a downloadable ‘pdf’ document. 3. Candidates have to submit application only through online mode well in advance in order to avoid last day rush. 5. Applicants willing to serve anywhere in the Telangana only should apply. 6. For any problems related to Online submission and downloading of Hall-Tickets please contact Help Desk No.040-23120303 (Call Time: 10:30 A.M to 1:00 P.M & 2:00 P.M to 5:00 P.M) or log on to http://tsgenco.cgg.gov.in click on to complaint box. 1. Applicants must compulsorily fill up all relevant columns/fields of application and submit the application through website only. The particulars made available in the website shall be processed through Computer and the eligibility will be decided in terms of notification. 2. The Applications received online in the prescribed proforma available in the website and within the time shall only be considered and TSGENCO will not be held responsible for any kind of discrepancy. viii) The signature will be used to put on the Hall Ticket and wherever necessary. If the candidate’s signature on the answer script, at the time of the examination, does not match the signature on the Hall Ticket, the candidate will be disqualified. The candidate has to upload his/her Photo with Signature in the prescribed format by clicking on the browse button at the time of submission of application form. 6. Important : The claim of the candidates with regard to the date of birth, educational qualifications and community are accepted only provisionally on the information furnished by them in their application form and is subject to the verification and satisfaction of TSGENCO. Mere admission to any test or inclusion of the name of a candidate in a merit list will not confer on the candidate any right for appointment. The candidature is therefore provisional at all the stages and TSGENCO reserves the right to reject candidature at any stage of the selection. 7. TSGENCO is not responsible, for any discrepancy in submitting application through Online. The applicants are therefore, advised to strictly follow the instructions and User guide in their own interest. 8. Applicant must compulsorily fill-up all relevant columns/fields of application and submit application through website only. 9. Incomplete/incorrect application form will be summarily rejected. TSGENCO under any circumstances will not entertain the information if any furnished by the candidate subsequently. Applicants should be careful in filling-up of the application form at the time of submission. If anylapse is detected during the scrutiny; the candidature will be rejected even though he/she comes through the final stage of recruitment process or even at a later stage. 10. Before payment of fee, submission of application form, the candidates should carefully ensure his/her eligibility for this Notification. No relevant column/field of the application form should be left blank; otherwise application form will not be accepted. 11. The applications received online in the prescribed proforma available in the website and within the time shall only be considered and the TSGENCO will not be held responsible for any kind of discrepancy. 12. Applicants must compulsorily upload his/her own scanned photo with signature in ‘jpg’ format only. (iii) All certificates relating to academic qualifications as required. (iv) Experience Certificate in the field of Personnel Management issued by a Competent Authority of the reputed manufacturing company. (iii) Certificate of Residence / Nativity. (iv) No objection certificate from the existing Employer where he/she is working. The Physical Handicapped Reservation will be applicable only to persons whose disability is 40% and above. 13. Candidates will be required to appear for ‘Written test/Examination’ as and when conducted at their own cost. 14. Admission for ‘Written test/Examination’ or calling the qualified candidates to the written test to furnish documentary proof does not confer any right for appointment. 15. The degrees awarded by the Universities/Institutions that are recognized by the U.G.C, D.E.C (Under IGNOU) and AICTE as the case may be, only will be considered. 16. The decision of the Selection Committee/TS GENCO is final in selection and allotment of candidates. #Submission of Applications through On-line from: 13.04.2018. #Last date for online payment of Examination Fee: 09.05.2018. #Last date for submission of On-line Application: 10.05.2018 @ 16:30 Hrs. #Hall-tickets can be downloaded from 20.05.2018 onwards. #The examination is scheduled on 27.05.2018.